Campsite Strasko is located on the island of Pag. With its 270km of beaches, Pag has the longest coastline in the whole Adriatic. 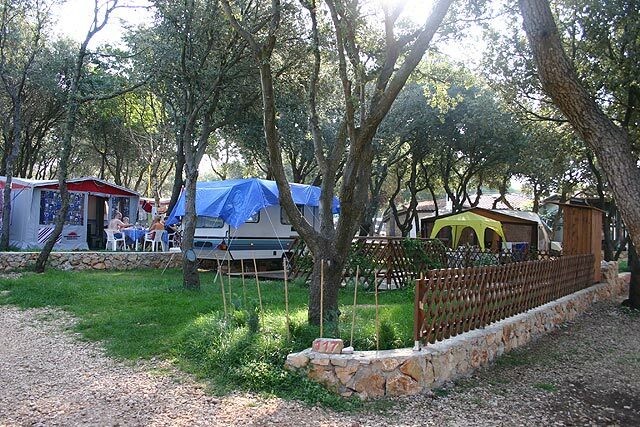 The Strasko campsite stretches over an area of 57 hectares of Dalmatian oak and olive trees, making it one of the largest camps in the whole of Croatia. 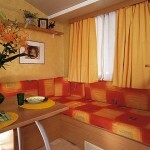 During high season it can accommodate up to 6000 campers. 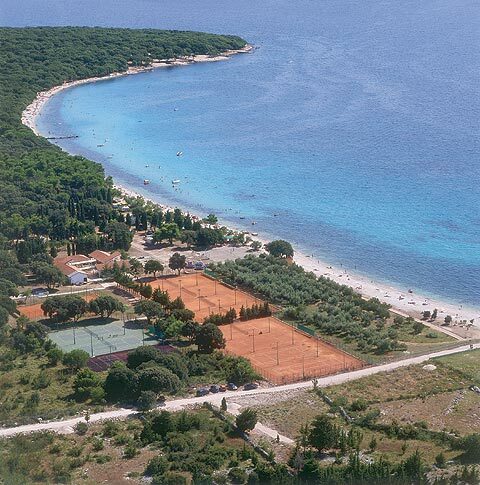 Strasko has a beautiful seaside setting with about 2km of pebbled beach. The sea bottom is made of sand, and one section of the beach is covered completely with sand, making it idealistic for kids. 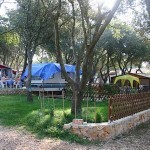 A smaller secluded part of the camp is for intended for naturists. The naturists own beach is rocky with nice stone-made platforms for sunbathing. Strasko campsite lies very peacefully in the vicinity of the Adriatic, but if you suddenly feel an urge to dance and party, you’ll find all you need just a couple of kilometres away in the village of Novalja. Novalja is the main city on the island of Pag, and there you will find the Zrce beach, which is well-known for its party atmosphere. With 3 open-air clubs and parties 24-7, it has earned the reputation as the “Ibiza of Croatia“. Strasko proudly exhibits the “blue flag“ given by the association “Lijepa naša” to the best beaches in Croatia. Especially popular are the small bungalows. Their comfort and spaciousness combined with the natural beauty of the Adriatic holds the promise of a dream vacation for a reasonable price. There are around 700 pitches within the camp area, all of them nicely located close to the sea. Sizes vary between 120-140m2. 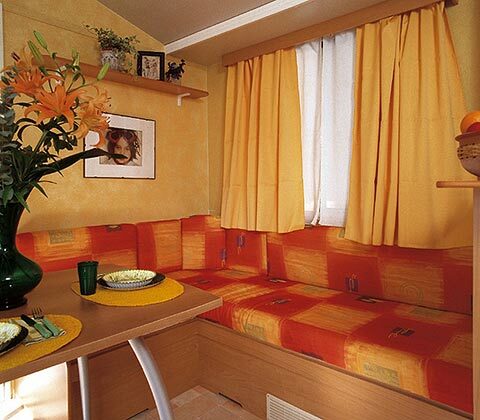 You can choose between the more equipped “pitches“, or simply just rent a camping space. On the pitches you are provided with everything you need, such as SAT-TV-connection, water, electricity, etc. 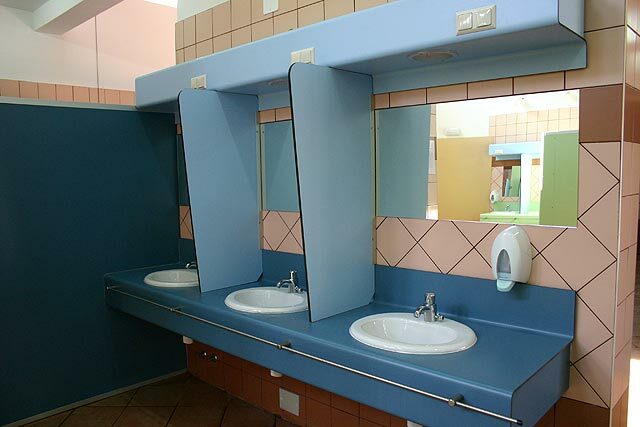 Toilets and sanitary units: There are 12 toilets facilities on the campsite and 8 of them are recently renewed, making them a pure joy to use. There is a fully equipped sanitary unit with clothes washing & drying areas, area for doing the dishes, baby changing tables and pet showers. 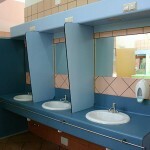 The toilets are disabling accessible, and there are additional chemical toilets placed around the beach and campsite. 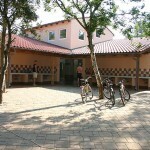 Food & drinks: There are several food-service facilities in the camp. They offer a great variety of dishes, ranging from ready made sandwiches to stone oven baked specialities. The camps pizza is said to be excellent, and if you need a refreshing drink there is a range of bars offering everything you need. The Nudist part of the camp has its own bar and restaurant. Shops: In the supermarket you’ll find everything you need. On the beach you also have small tobacco shops. Fresh bread for your breakfast can be found within the camp area. Camp Strasko offers a great variety of chooses in this area. There are pitches for playing volleyball, Tennis, basketball and badminton. There are tables for table tennis, kite surfing and aerobics. If you want to explore the near islands and beaches for yourself, you can rent a sailboat for that purpose. Or if you’d rather explore the depth of the Adriatic Sea, you can go diving with Foka diving school, located in the camp. They offer courses for both junior and senior campers, as well as excursions in the near area. 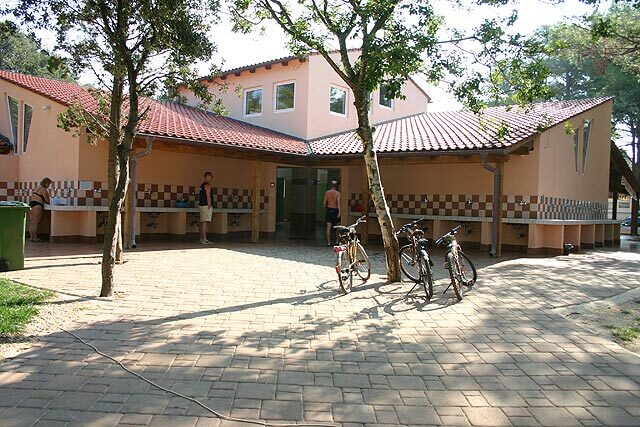 A smaller part (20 hectares) of the camp is intended for nudists, with its own sports & recreational centre, tobacco shop and restaurant. 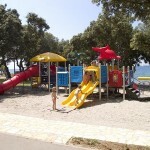 You can travel between camp Strasko and Novalja by road, or take your bike along a forest-path. The distance is only 2km, so you can easily cover it by foot if you wish. Transport that links the island, as well as Novalja, to the mainland is excellent: From May 30th to Sept 30th, ferries between the mainlands (Prizna) to the Island Pag (Žigljen) operate around the clock, driving 13 times daily in both directions, 05:30 to 22:30 hours. The island is also connected by a bridge from its southeast side. A number of daily bus lines connect Novalja with almost all Croatian regions (Rijeka, Zagreb, Zadar, Split, Varazdin and Pozega in summer). A fast catamaran line connects it with Losinj, Rab and Rijeka. The “Pag triangle“. Mysterious stone formation discovered in 1999. Some say it’s an ancient UFO landing site. Whatever it is, it’s worth a look.